At Kelly’s Tree Care we have 2 different sizes of stump grinders to suit your needs. Both machines will grind the stump up to a maximum depth of 10 inches. Individual roots under the surface which can radiate out significant distances are not removed as this is not practical. These roots are left in the soil to decay and add organic matter to the soil. 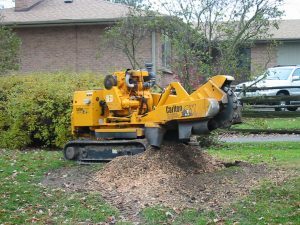 Unless otherwise requested, the stump chips that are produced by the chipper are raked into a pile back over the stump area. The chips make excellent mulch and can be spread over the root system of trees, shrubs and plants. To sod over a stumped area, clients can remove the stump chips and replace with top soil before adding sod or grass seed. 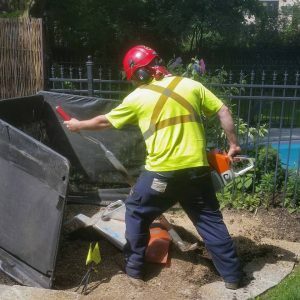 Our large stump grinder is 36 inches wide and as such we require access which can accommodate this width through gates and around window wells or air conditioner units. This machine cannot climb steps or travel across steep grades or go over wooden decks. The stump must be on relatively flat even terrain. For small stumps or where access is less than 36 inches wide or the stump location is in a tight or awkward space (e.g. within a raised planter), we have a portable stump grinder. Any stump removal request is subject to underground locate clearances which are to be arranged by Kelly’s Tree Care.